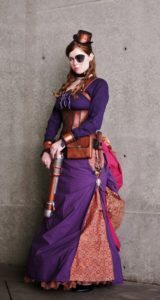 Tayliss Forge – Golden Coast Adventure Faire – Where History & Imagination Collide! Tayliss is a cosplay model and artisan crafter. 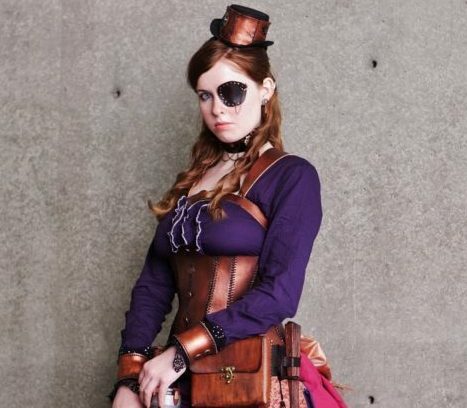 She was also a contestant on the show “Steampunk’d.” A majority of her time is spent making costumes and accessories for her online business: Nonconformity Accessories. She loves leather-working and creating corsets, bracers, purses, etc. She also enjoys making replicas of props, jewelry, and clothing from movies, TV shows, anime, video games, or board games. She often attends anime and comic conventions where she wears her costumes. Most of her costumes are heavily influenced by steampunk and Victorian fashion. Tayliss will be bringing up a small collection of items to sell, mingle with the fans and will also be doing a 45 minute class on creating a pattern for UnderBust corsets in Johnson Hall. Interested parties will create the patterns under Tayliss’ tutilage and will be able to take home for finishing. She also teaches a two hour version, and the students can discuss more with her after the class. Prepare for YOUR ADVENTURE with Tayliss! One class each day, times to be determined.